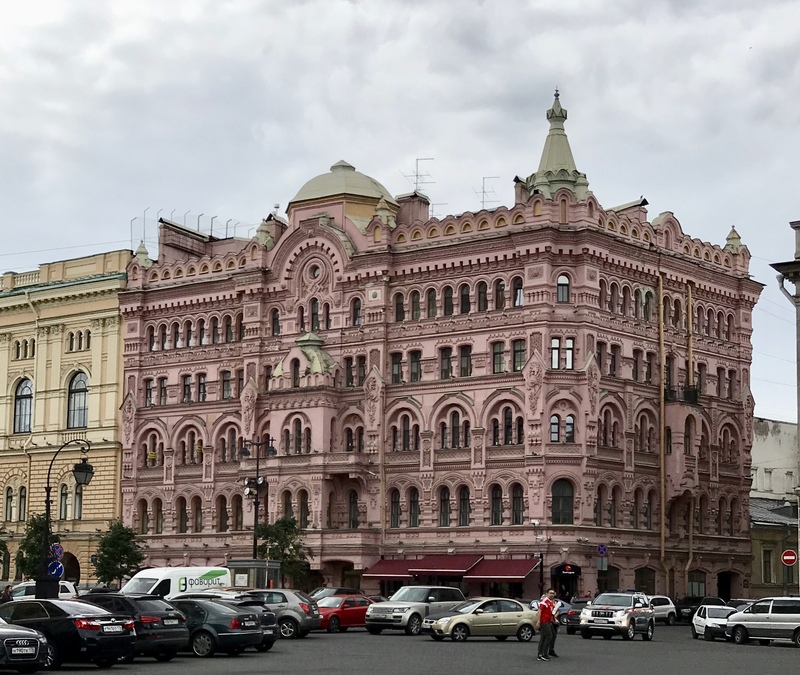 Something I didn’t realize about St. Petersburg is the fact that it is a relatively young city and played an important part in the westernization and formation of the Russian Empire. After Peter the Great took land from Sweden in 1703, he founded the city and named it after his patron saint. I don’t want to get into a lot of history, but Peter built the city using slave labor from all over Europe for construction, and he outlawed the construction of stone buildings outside of St. Petersburg so stone masons would work only there, thus enticing the rich to move there to build their elaborate homes. In addition, Peter hired educated Europeans—engineers, architects, shipbuilders, scientists, businessmen, professors—to bring skills to the new city and to give it a more European vibe than Moscow or any other city in Russia. In 1712, Peter moved the capital of Russia from Moscow to St. Petersburg, and it remained there until the Russian Revolution in 1918. Miles and miles of identical flats that housed the thousands of lower-class citizens spread out from the city center where the Russian elite moved and built grand palaces that became the center of society and life in the city. The Russian Revolution and wars damaged and destroyed many of the historic buildings in the city. While the entire city center is a UNESCO World Heritage Site, there are still many problems in the restoration, renovation and preservation of the more than 15,000 historic buildings there. A law passed in 2009 protects the “objects of cultural heritage” in St. Petersburg, but shoddy construction and back-room deals still threaten them. The palaces were part of the reason I wasn’t wild about St. Petersburg. “Are you absolutely gob-smacked at the contrast between the former royal residences and the contemporary reality?” my friend Carole asked me when I posted a photo of one of the palaces on Facebook. All I can say is I am and I was. Let me show you a few of the palaces we saw, and you can decide for yourself. 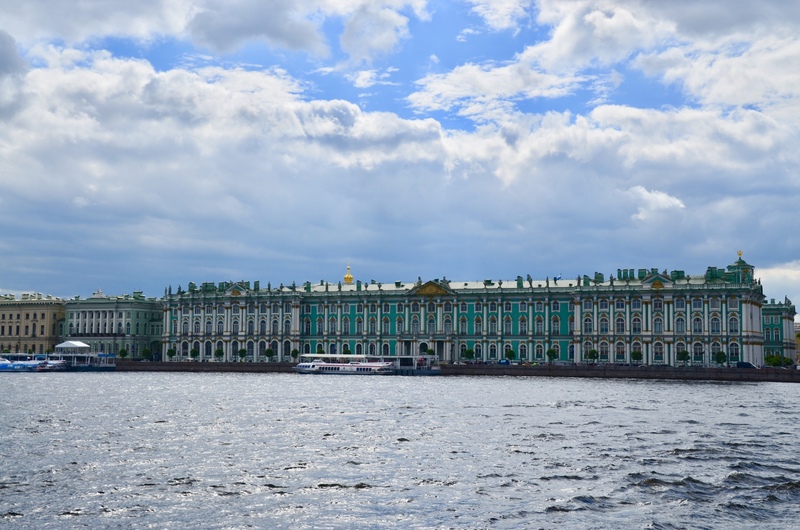 Located on the banks of the Neva River, the Winter Palace was home to the Russian Czars for almost 200 years. 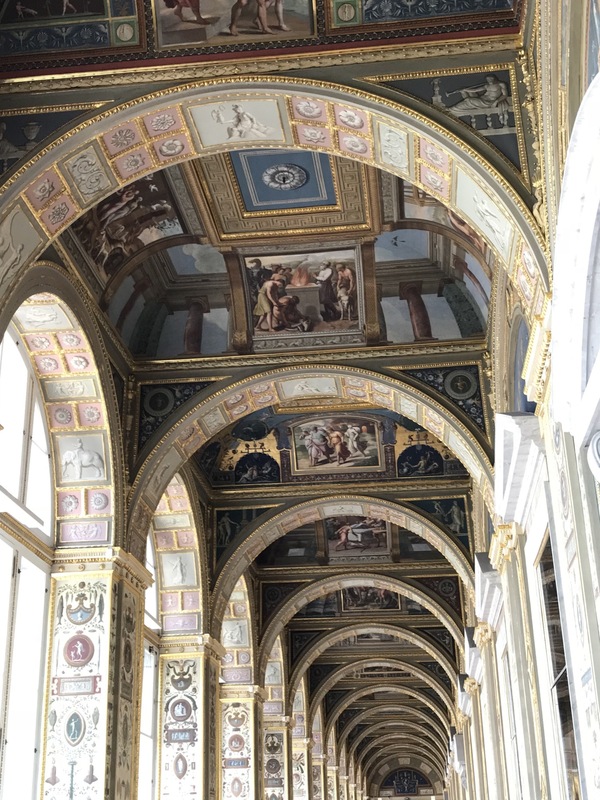 Now home to the Hermitage Museum (more on that later), the palace has 645,835 square feet of space and a façade that spans 820 feet. There are more than 1000 rooms and almost 2000 windows in the palace, and the dining room table could seat 1000 people. Think that’s amazing? Some of the state rooms could hold 10,000 standing people; they provided no chairs. 1-When construction on the building ended, there was quite a bit of debris surrounding it. In order to get rid of it, the czar declared that the citizens could take anything they wanted for free. Since the debris was from the palace and, supposedly, of good quality, people thought it would be worth money. Within hours, the trash was gone. 2-In the late 1780s, Empress Catherine II commissioned the Raphael Loggias for the Winter Palace. They are exact copies of the gallery of the Papal Palace in the Vatican. 3-Over the years, the palace façade has been different colors including red and pink. It has been green and white since 1946. 4-After the palace burned in 1837, workers labored around-the-clock for 15 months to restore it. 5-Peter built the huge palace to reflect the power of Russia which, at that time, ruled almost 1/6 of the world (landmass). As I mentioned above, Peter the Great was influenced by much of the grandeur of western Europe, and he endeavored to recreate his versions of the cities in St. Petersburg. 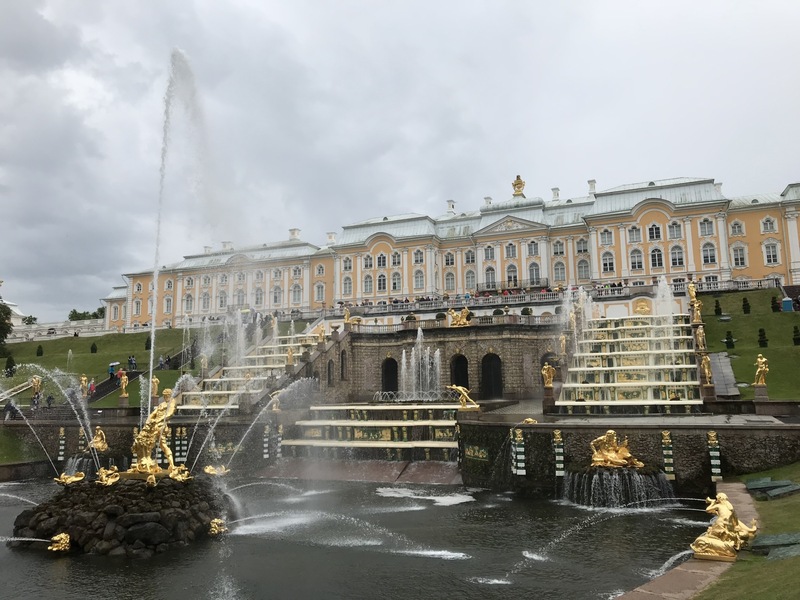 Peterhof Palace, deemed the “Russian Versailles,” was Peter the Great’s personal palace, and he chose a spot on the Bay of Finland 30 km from the city. Itself a UNESCO World Heritage Site, the palace now is a museum, but the grounds are the most visited attraction there. Located southwest of St Petersburg, the complex includes smaller palaces, gardens, pavilions, and more than 39 miles of canals. One of the canals, which is part of the Grand Cascade, runs from the bay to the palace so that visitors could disembark and immediately walk into the palace. 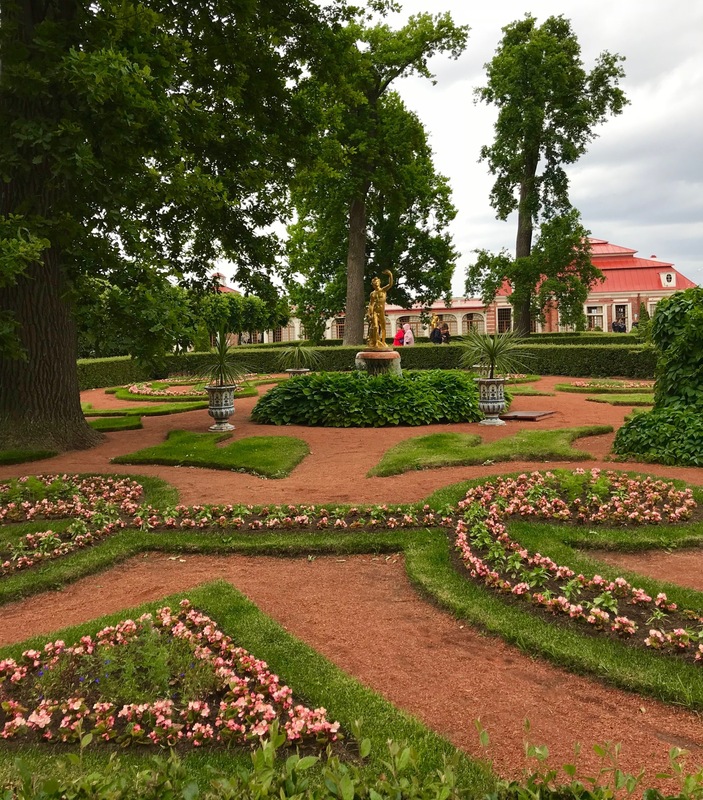 Peterhof has more than 140 fountains and cascades, hundreds of sculptures/statues, and more than 500 acres of gardens and grounds. 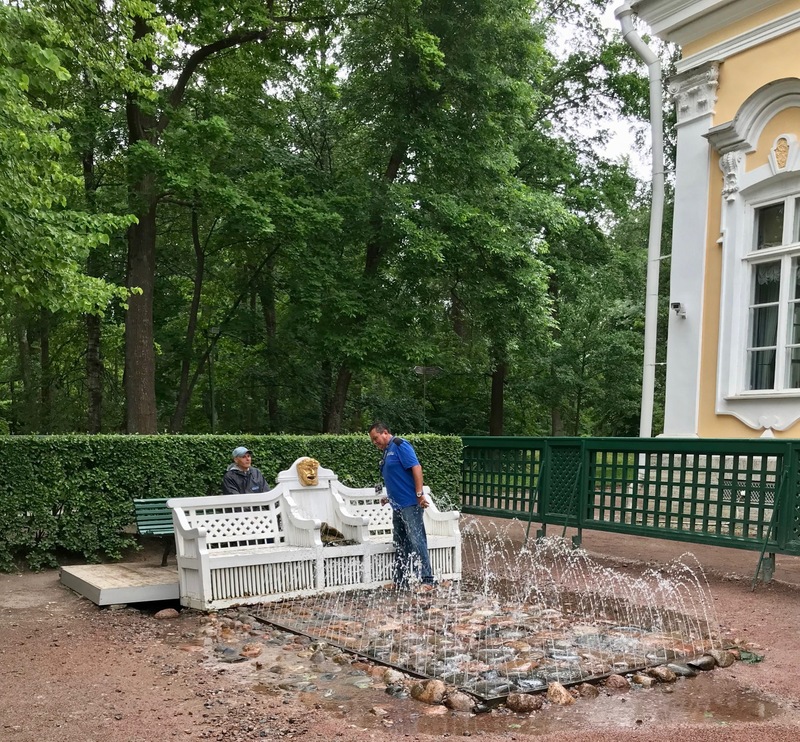 Interestingly, there are no pumps to run the fountains in Peterhof. The slope of the land on which the park sits provides enough gravity to pull the water to run the fountains. A number of the fountains have surprises for visitors. Get to close to a tree or two, and you trigger a mechanism that will shower you with water. Tired? If you sit on a certain bench, the man sitting behind you just might activate fountains to soak you (above). Both the upper and lower gardens feature many the fountains. The lower gardens are French by design and tend to be more geometrical in design. The landscaping of the upper gardens, however, is more random and less formal. The fountains and sculptures in the gardens were not original to the park, by the way. In 1717, Catherine I hired a German architect to build a summer palace where she could relax. 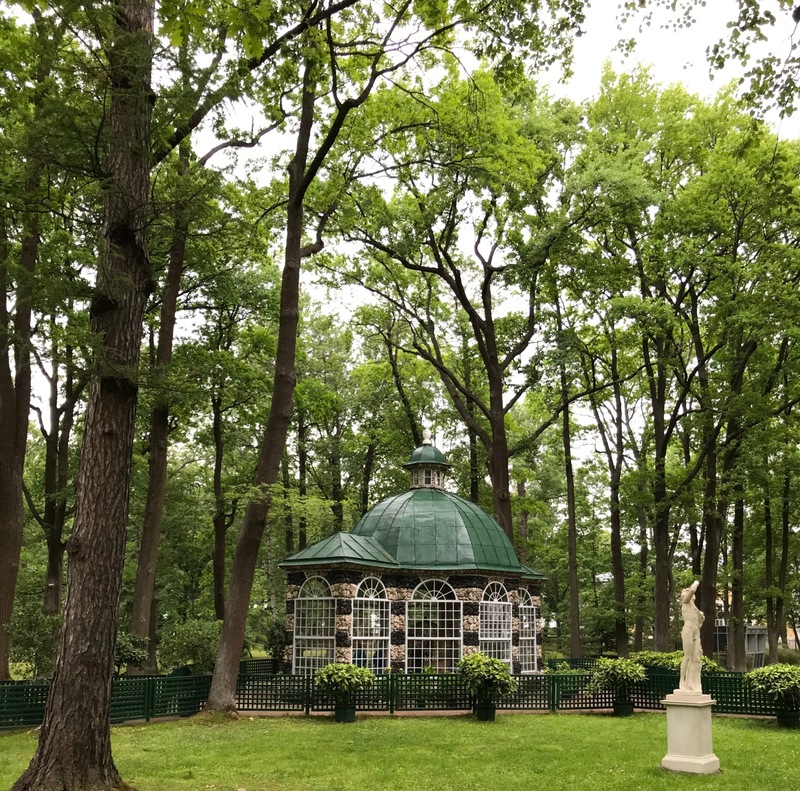 The Catherine Palace sits in Pushkin, a town about 30 km from the city on what was the “Czarist Road,” the road the czars traveled from St. Petersburg to Moscow once the capital moved. In 1733, Catherine’s daughter, Elizabeth, ordered the expansion of the palace, and in 1752, she ordered her architect to demolish it and enlarge it. And, enlarge it he did. The 325 meter-long palace (1066+ feet) took four years to build, and more than 220 pounds of gold adorned parts of the façade. Little of the palace survived the Nazi invasion during World War II. If you look at the two photos above, everything that is brown was originally covered in gold. The huge palace, a seemingly endless collection of rooms, chambers, hallways, and staircases all masterfully restored to its past glory. Everything is covered in gold leaf, so much so that the color bothered my eyes. 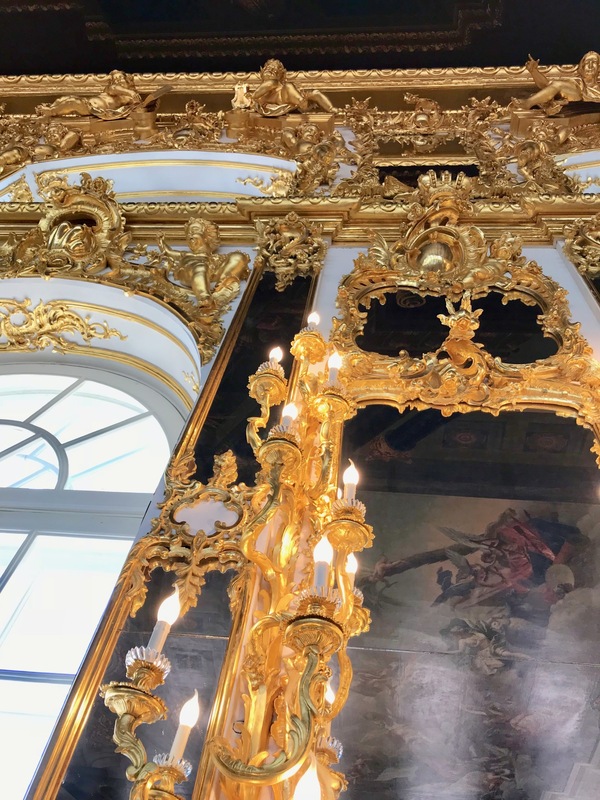 The room that gets the most attention from tourists seems to be the Amber Room, which was originally a gift to Peter the Great from the King of Prussia. As the name implies, the room is decorated with panels and carvings of amber, some backed with gold leaf. The 590-square-foot room contained over 13,000 pounds of amber. During World War II, the Russians tried to disguise the Amber Room under wallpaper in an attempt to hide it from the Nazis, but their attempts failed. The Nazis dismantled the room and moved it to Königsberg, Prussia, where they displayed it. The original room’s whereabouts today are unknown. In the late 70s, the Russian government decided to recreate the room using photos and original drawings of the Amber Room. It took almost 25 years and 40 amber craftsmen to complete the project. There are almost 1000 pounds of amber panels, 350 shades of the gem, carvings, gemstones, mirrors and candles in the room. Many believe the reconstruction is very close to the original room. Photos are not allowed in that room, but you can see what it looks like by clicking here. If you think the palaces are ornate, wait until you see the churches.